First off, my apologies for the poor photography - the project was too big for my little studio so I had to lie it on the floor! 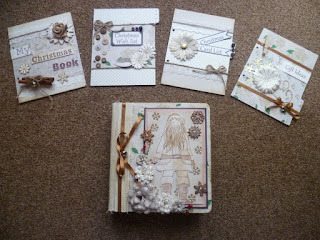 This has been made with a new Digistamp design of Santa Claus and a Vintage Christmas digital download paper pack. The book is MDF (Surprise, surprise!) and all the dividers are MDF too - the book does come with 6 dividers and two end pieces though I've only decorated 4 out of the 8. 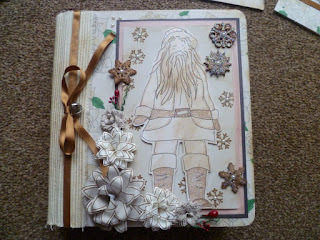 The Santa digi has been distressed with 'Gathered Twigs' (A new favourite I've found! 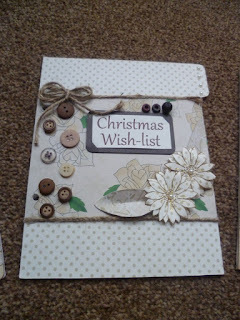 ), and small parts have been coloured with Tan and Cinnamon Pro markers. 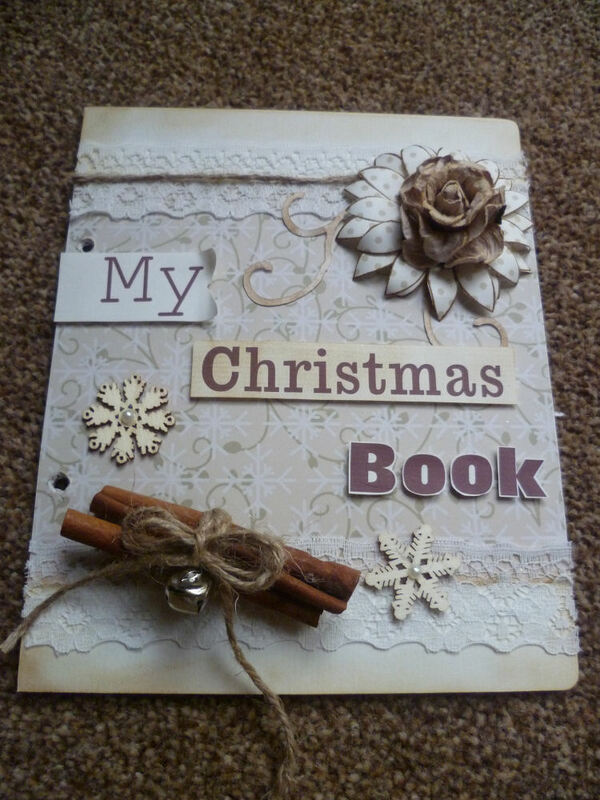 The book has been bound with a fabric place mat from Wilkos, and all embellishments are wooden snowflakes (Woodware) and Berry sprigs. The flower selection have been made with our 'Large Flower (2)', 'Flower (2)' and 'Small Flower (2)' stamps - they're made by stamping out three and creating a sort of rose layering system with them. The first stamped flower you snip into it between two of the petals, out of the second you cut two petals, and the third four petals - throw away the two petals piece. Wrap each layer around and glue together, then layer inside each other. 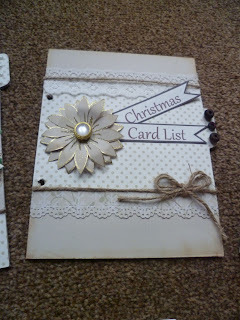 I used cream and plain brown papers for these - alternating depending on size. 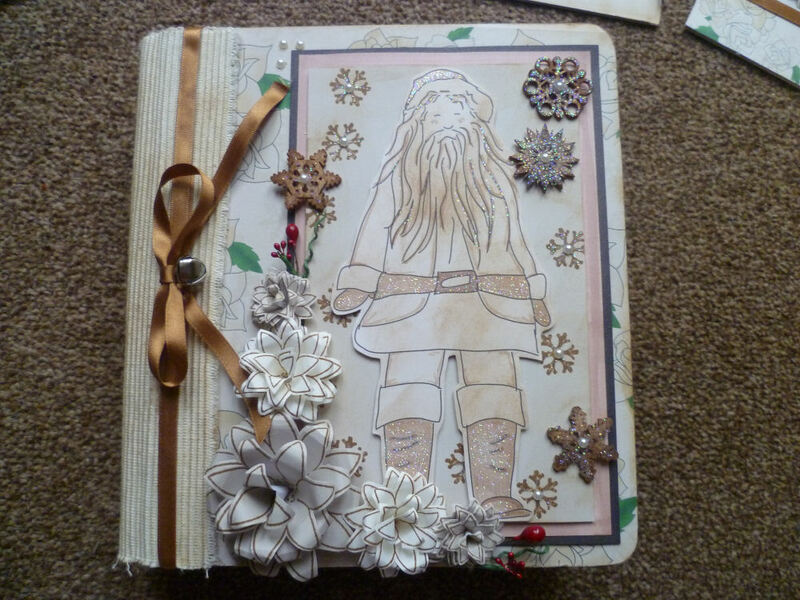 My first page, I covered in plain cream paper and attached a strip of patterned across the centre (I decided to do the same sort of thing per page as a base). I then added lace and twine to embellish. We took a trip to the Ross Papercraft Show at Don Valley stadium yesterday too so I grabbed some Cinnamon sticks (real and gorgeously smelling!) and some other little bits & bobs to add to the stash! 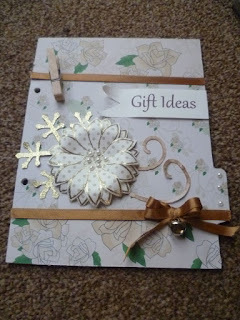 I used twine to tie two sticks together and glued onto the lower left - the 'Large Flower (2)' stamp was used on spotty paper from Vintage Christmas digital download and embossed with gold WOW glitter embossing powder. I then added a paper flower in the centre. I printed out the words 'My Christmas Book' and cut them up for across the middle. 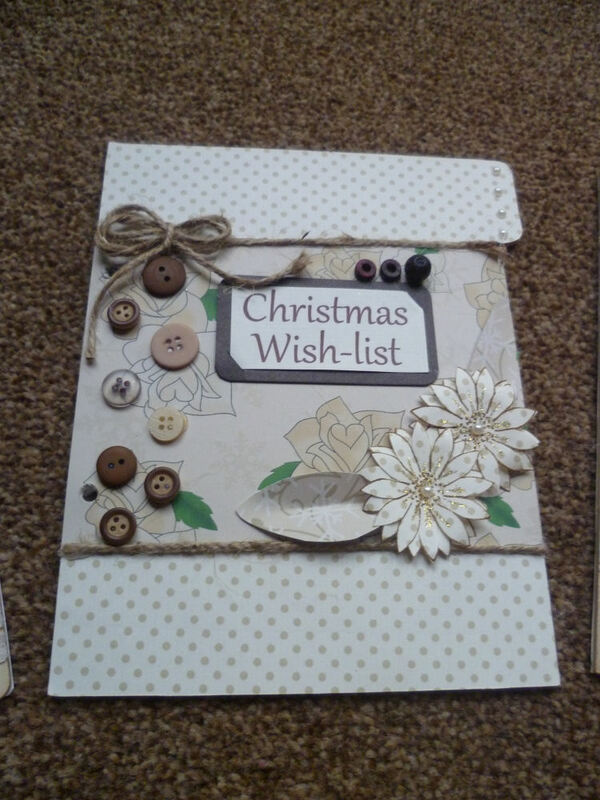 The same sort of principles apply for the three dividers - I did the basic covering of the MDF and then a strip across in a coordinating paper - added either twine, ribbon or lace across the joins and then continued from there. The same flowers were used throughout the making and some extra buttons, gems and pearls too. The swirl and snowflake die-cuts are available online from Dreamees and can also be bought on our Cuttables CD range for the CraftROBO & Silhouette. Hope you love this as much as I do! I do have a couple more projects to blog soon though they've been made especially for two very lovely people so I can't write them up until I've actually given them out. Well, well, well! 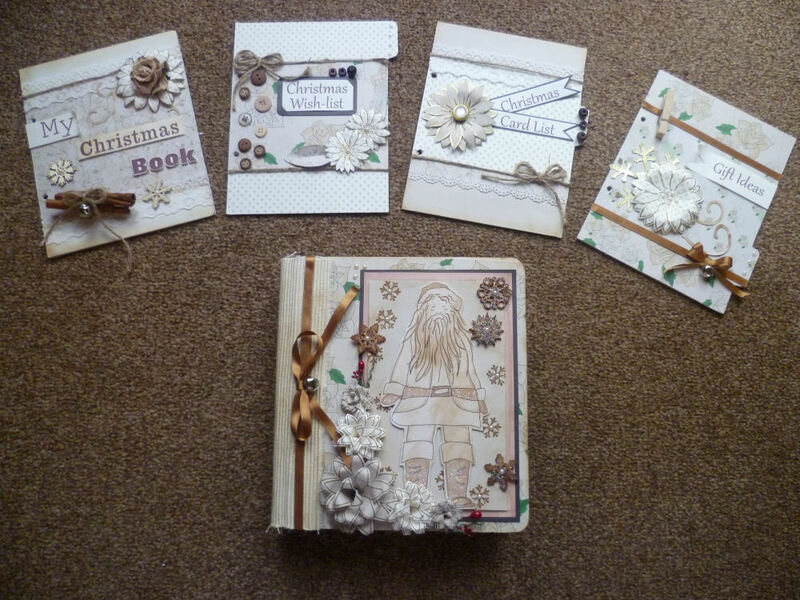 I just got around to posting on the blog! Here's a few pictures of how our stand looked at the NEC - right from the beginning up to the final stand we created! It was such a fabulous experience (once we got the hang of where we needed to be and got over the lack of sleep we were having!) and we're pleased to announce that we will definitely be on the same stand next year!! Our stand had this as the centre piece (which will soon be featured in Simply Homemade, thanks to the lovely editor we met at the show! - we're also featuring 3 other projects in the same issue too!) and so many people complimented it, requesting pictures too! Oh, and we can't forget meeting the lovely Nigel again, and Bev from over at Cupcake Crafting! We hope you had a lovely day if you visited us and we can't wait to see you again - also, if you did pick up some Dreamees products be sure to email us over some pictures of your creations to: sales@dreamees.org.uk! All images copyright of Dreamees. Edited by Hayley @ Dreamees. Simple theme. Powered by Blogger.